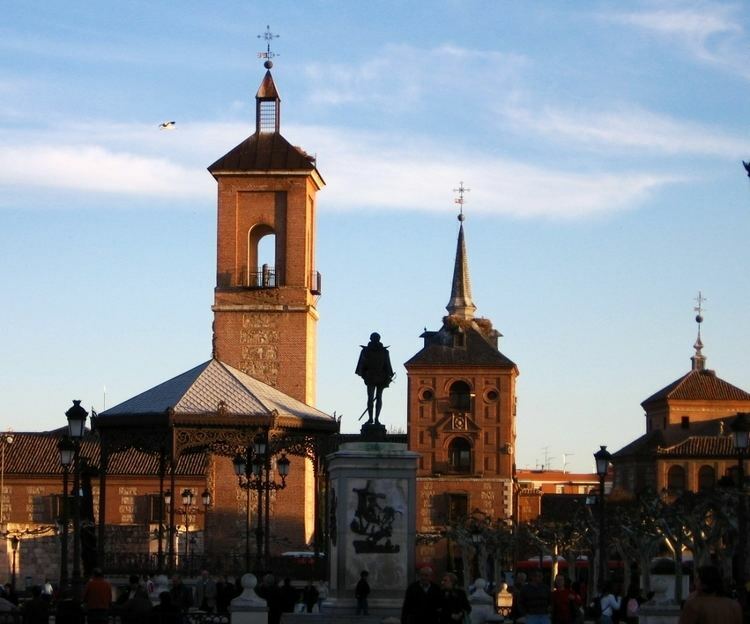 Alcala de Henares , meaning Citadel on the river Henares, is a Spanish city whose historical centre is one of UNESCOs World Heritage Sites. The city stands out for its rich archaeology and was one of the first bishoprics founded in Spain. Located in the Autonomous Community of Madrid, 35 kilometres (22 miles) northeast of the city of Madrid, at an altitude of 588 m (1,929 ft) above sea level, it has a population of around 200,000. 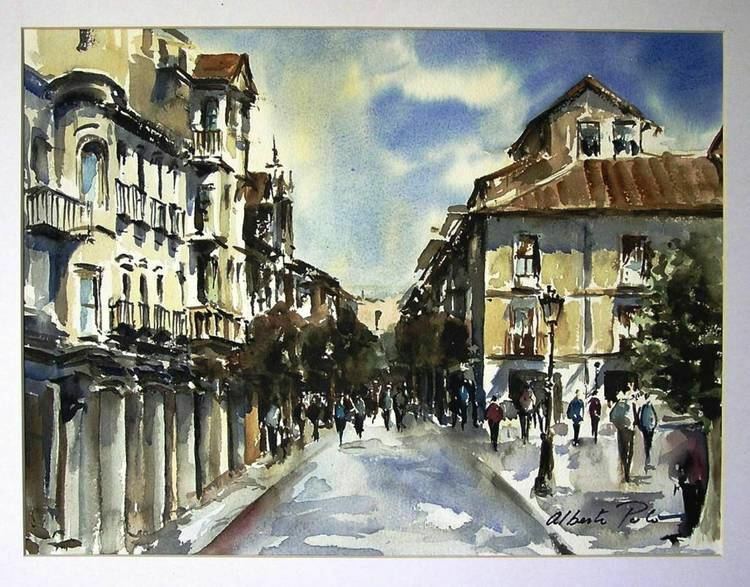 Locally, the city is generally known simply as "Alcala", but "de Henares" is appended when needed to differentiate it from a dozen Spanish cities sharing the name Alcala (from the Arabic word al-qala ?????? for fortification or citadel). The Latin name, Complutum, is sometimes used. The city is capital of its namesake region, Comarca de Alcala. The city boundaries have been inhabited since the Calcolithic phase of the Bronze Age. Romans conquered the area in the 1st century BC, and built the town of Complutum near a previous Celtiberian settlement, called Iplacea. Thus, it became the only Roman town in the Madrid region. With 10,000 inhabitants, it reached the status of Municipium and had its own governing institutions. After the downfall of the Roman Empire, under the Visigoths, it declined, although it also became a pilgrimage destination in remembrance of the Saints Justo and Pastor. When the Moors arrived in 711, they subdued the Visigothic city and founded another site, building an al-qala, which means "citadel" in Arabic, on a nearby hill, today known as Alcala la Vieja (Old Alcala). On 3 May 1118, it was reconquered by the Archbishop of Toledo Bernard de Sedirac in the name of Castile. The Christians preferred the Burgo de Santiuste ("Saint Justs borough") on the original Roman site and the Arab one was abandoned. The city was ceded to the Bishopric of Toledo, which granted it ferial rights. Under Christian rule until the end of the Reconquista, the city had both a Jewish and a Moorish quarter and a renowned marketplace. Its central position allowed it to be a frequent residence of the Kings of Castile, when travelling south. At some time in the 1480s, Christopher Columbus had his first meeting at the "Casa de la Entrevista" with the Reyes Catolicos, Ferdinand and Isabella, who financed the travel for the Discovery of America. At an average of 654 m of altitude, on the southern part of the Meseta Central and occupying some 88 km²; the city was for a long time encapsuled between the hills and the river Henares to the south and east by the Madrid-Barcelona railway on the north and west. However, the expanding population has forced two new residential areas to be created between the railway and the motorway and beyond the latter. The historical centre lies roughly in the middle of the urban area. It is characterised by lower, Spanish Golden Age buildings, of which the most lavish belong to the University. These historic buildings gained for the city the title of World Heritage Site, awarded by the UNESCO in 1998. Surrounding it there are the high, swiftly built blocks of the 1960s, during the Francoist era. They fill spaces to the north up to the railway line and to the west up to where the industrial zone begins. This was erected in the early 1960s and has developed and expanded. Now it occupies more than a third of the citys area being cut by the railway and motorway.